Last Sunday I took a stroll up Reinebringen to checkout the progress on the Sherpa trail. 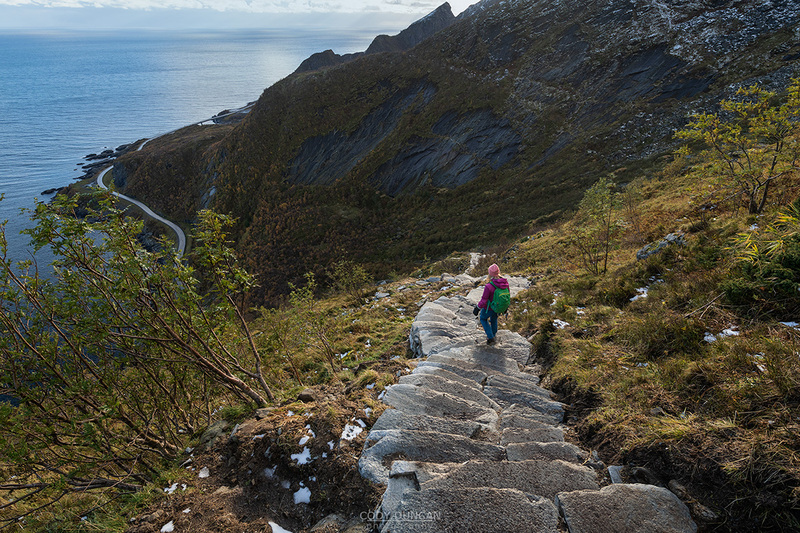 After 3 years of work, there are now 870 (I think) stone steps built up the steep hillside to Lofoten’s most popular view. Even on this stormy October day, I passed more people than I would have in July only a few years ago. It goes to show the power and influence of social media on the outdoors. Reinebringen has stood as a destination for many years, yet it is only now that a stone stairway has been required. How many other places in the world are experiencing the same change? But now, there are 870 steps up the mountain. The last 150 vertical meters still have no steps, and are as dangerous as before – not because you will slip and fall, but due to the loose rocks. And indeed, on my trip up the mountain, a group descending above me sent several rocks flying my way. And of course, they weren’t experience in mountain travel, so didn’t even know to shout ‘Rock!’ or ’Stein!’ as they came tumbling towards me and my friend. However, while it might not be idea camping and outdoor weather this autumn, the light has been amazing! I have just finished my second workshop (of 4 this autumn), and each day brought something new and exciting, and completely different than the previous week, where wind was a major element. This past week the weather slowed, the showers lasted longer and the rain fell heavier. But this also allowed more predictability in what might happen with the light. The next part was just to get to the right place and hope that the elements aligned. First snow of the year! To say the last week has had stormy and dramatic weather would be an understatement! The Lofoten autumn seems to be making up for lost time last year and is throwing all it can at us this year with multiple days of gale force winds, stinging hail and the autumns first dusting of snow on the mountains. This image is from Monday and by now on Friday morning the snow line had sunk to around 350 meters, with everything above nice and white, while everything below is fantastic yellows, golds, reds, and oranges of autumn. It has been some years, if memory serves me correct, since we’ve had such an early snow fall here – well, mostly hail and graupel, really – but it’s still white! The past week I’ve been out guiding my first workshop of the season, a private tour with four brave ladies from Hong Kong. Had I been alone, I would have sat at home and watched Nextfix most days. But the weather provided some fantastic light and wild seas. I think I’ve already managed at least 5-6 images that will go into this years autumn gallery here. The only major thing lacking was northern lights, with only one small night of somewhat clear skies in-between passing hail storms. 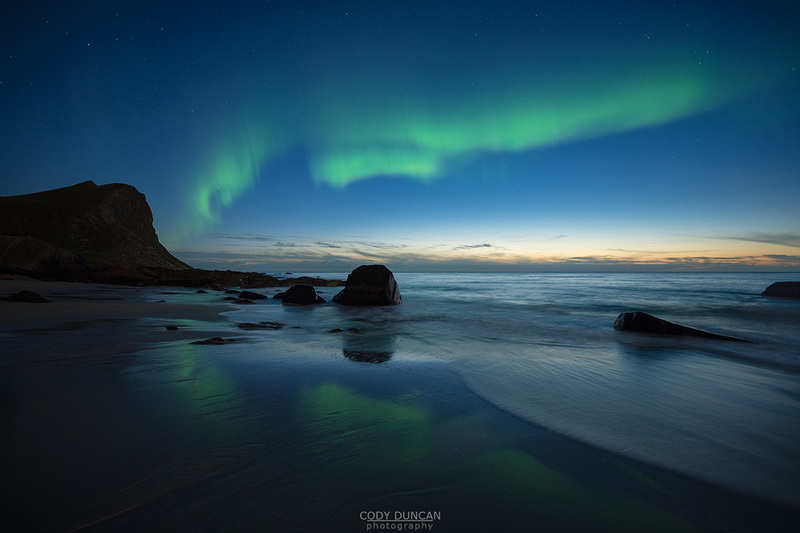 Quite a change from last September, where the aurora seemed to dance almost every night! But that is how things go here in the north, a good year often followed by a bad one – all things must come to a balance. 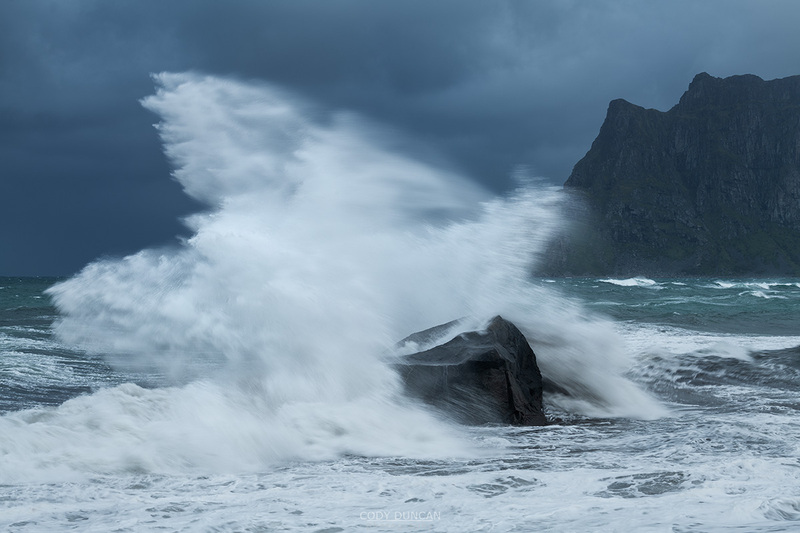 The last days have seen the fury of the first autumn storm over Lofoten. Wind, rain, clouds, and more wind. The Gimsøy bridge has been closed for some periods on Thursday and several ferries were canceled. Luckily, autumn seems late to arrive this year, and not too many leaves have blown off the trees as far as I could see. In other years, the autumn color could have ended today. Which is why autumn is always a bit of a risk here, as one never knows what will happen. 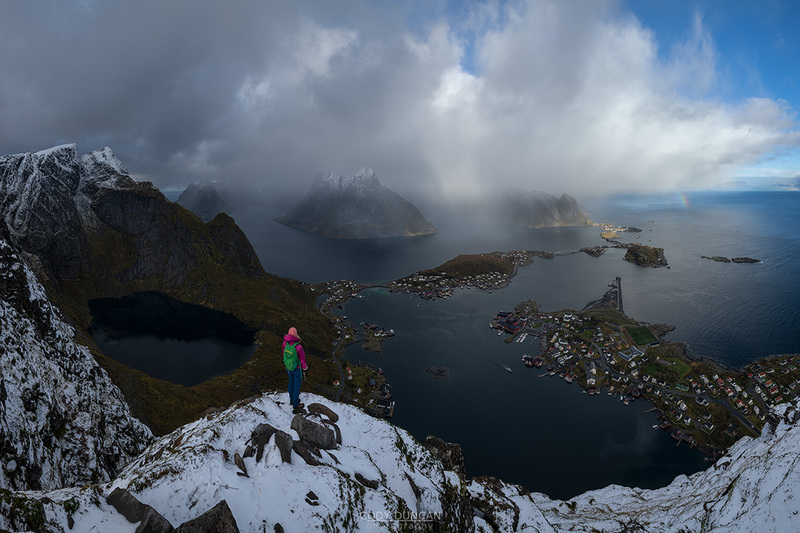 This is a 6 image pano from an approaching weather front while on Gimsøy. Autumn often brings a dramatic change from the weather of summer. 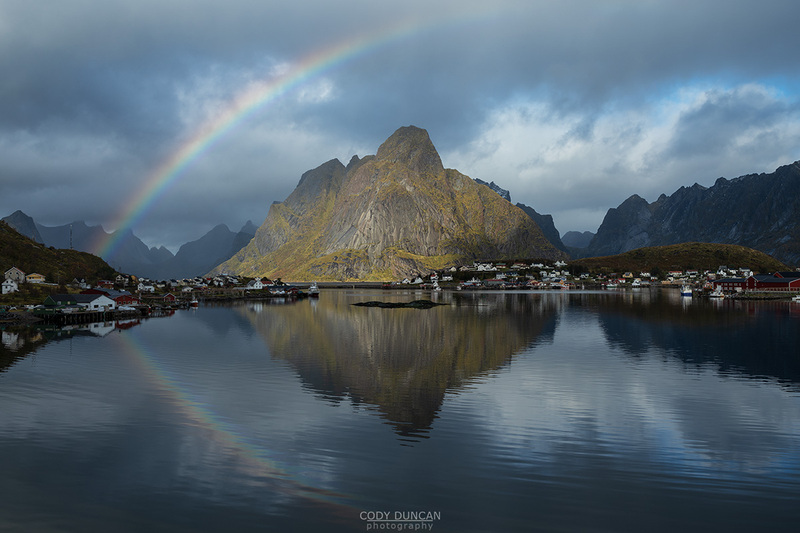 Autumn is the season of rainbows, and the season of dark skies – often on the border of being able to shoot and having to run back to shelter from the sideways rain. But bad weather makes good photos. 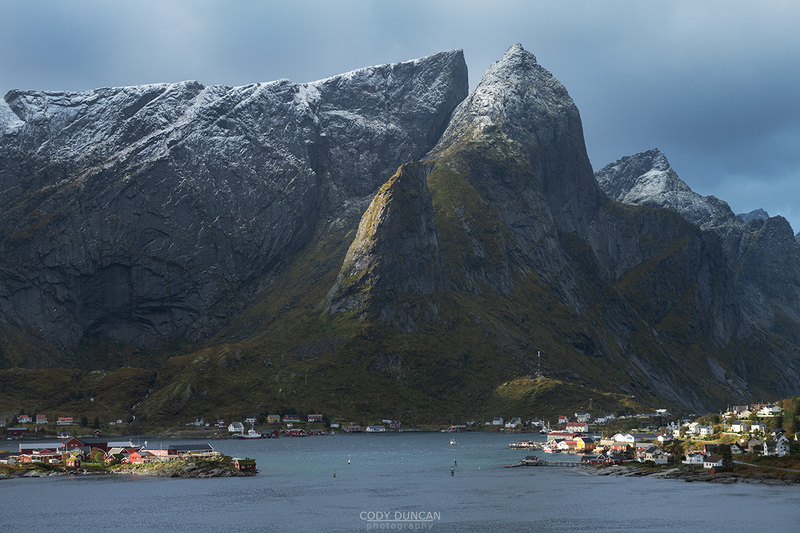 And so that is why autumn on Lofoten is one of my favourite seasons to photograph. One of the things I like about the start/end of the aurora season is the twilight glow which remains on the horizon throughout the night. Beyond the fact that it keeps the overall scene brighter and adds light to the landscape, I find it nice to have a separation on the horizon, with the sky fading to a deep blue the higher it gets. And even though the sun is spotless at the moment and the KP index was only a 1 or so at the time, never rely on this too much. I see so much talk online about KP this or that, but the reality is, it doesn’t matter all that much. And just like the weather forecast up here, the aurora forecast is mostly a suggestion of what will likely happen, but there is still a fair amount of unknown. So tip of the day: If the sky is clear – go out! Sometimes I feel like August is a light switch here in the north. Suddenly the nights feel dark again, the roads seem to have emptied overnight, and the weather has that first autumn chill. 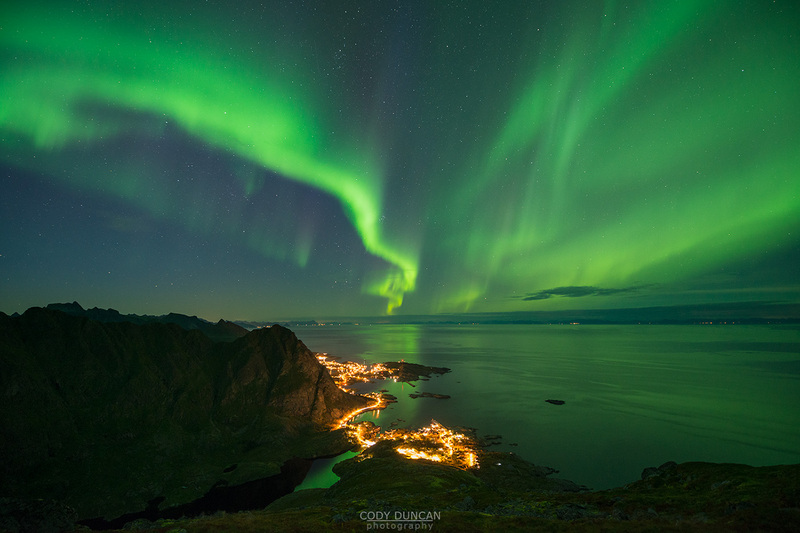 And August means that the aurora season is only a few short weeks away. I will miss the endless summer nights, and after the cold rainy weather of June this year, July turned out to be fantastic! 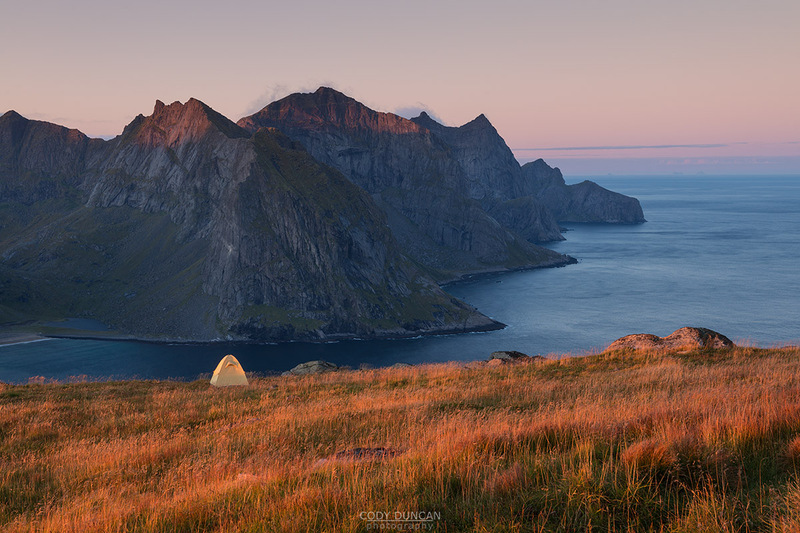 One of my hottest summer’s here on Lofoten – often too hot for the mountains actually! But summer will be back next year. And before the winter snow arrives there are still plenty of nights to be had out in the mountains – not under the midnight sun, but under the dancing aurora. Last year, September’s weather seemed to be better than the whole of summer. With many clear, calm nights. This also coincided with some strong solar storms – Any talk of the coming solar minimum stuff in BS as far as I’m concerned. So I was lucky with several nice nights looking for some interesting new compositions to shoot under the northern lights. This is a tricky pursuit however, with a high miss rate, as, unlike a sunset or some clouds in the sky, you can never be certain where the aurora will appear. A few times though, I seemed to be in a decent location with the aurora working fairly well for me. Such as this shot here, where I was camped on the summit of Andstabben, with the village of Å below me. Normally I’m not a fan of distracting city lights in aurora images, but in the case, with the aurora almost perfectly aligned with the direction of the lights below, it works for me. 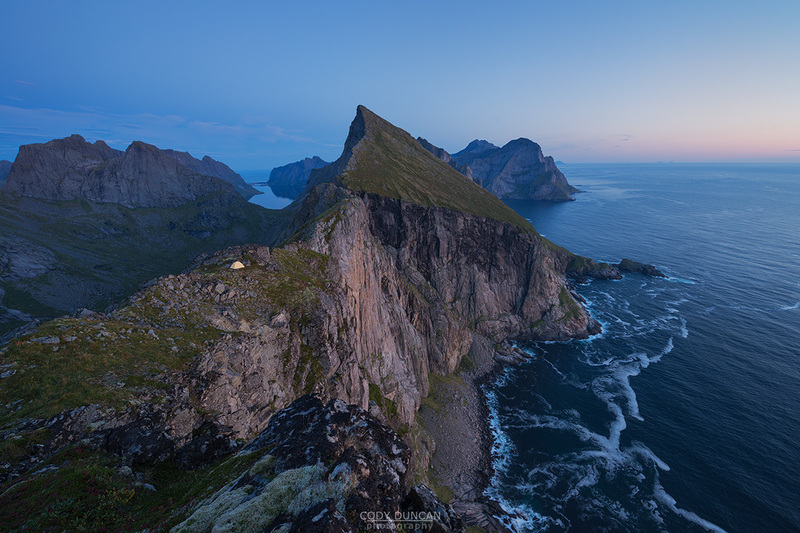 After a process of more than 10 years, and with a fair amount of local opposition on Lofoten, last week the Norwegian government announced the creation of Norway’s 40th national park – Lofotodden Nasjonalpark. (NRK article here). 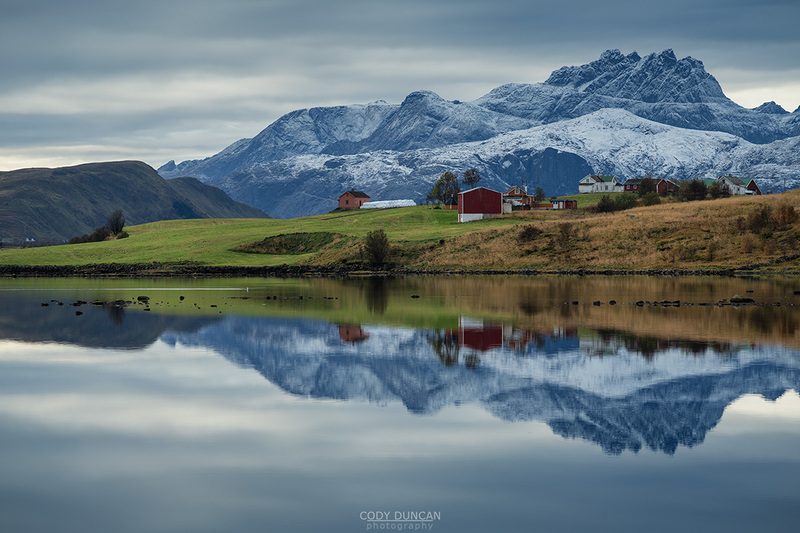 More or less covering the whole northern coast of Moskenesøy before wrapping around the western tip of Lofoten, the park will include many of Lofoten’s most wild and rugged mountains and valleys. Some of the opposition comes from loss of usage rights among people who might have property within the new park boundaries. But there is also the fear that the national park will bring an unsustainable amount of visitors to Lofoten. This, I disagree with. In my opinion, the current rate of visitors on Lofoten is already unsustainable with the current infrastructure. And popular areas which will now be within the new park, such as Kvalvika or Bunes beaches, have no facilities to manage the waste of the thousands of campers each summer season – that is a lot of shits being buried under rocks, at best, and otherwise often sat out in the open, dirty toilet paper blowing away in the wind. Hopefully, if done right (which I’m not 100% confident of), the new national park can bring with it the funds to help build facilities needed for current and future use of this fragile arctic landscape. And beyond facilities, hopefully the authority of now being within a national park will also lead to better education of visitors and their increased respect for the land. This is just my hope though, what will actually happen will be seen in the years to come. And hopefully it doesn’t mean that I now need to pay to park when I visit my favorite mountains or beaches, with otherwise no further benefit. In honor of yesterday’s release of the 2nd edition of my West Lofoten Hikes ebook, I thought I’d post a photo from one of the new hikes I added to the ebook: Fuglhuken – a 557 meter peak on the northeast corner of Moskenesøy. As September of 2017 had such fantastic weather, I would often head out for just an evening in the mountains. On this particular trip, the forecast called for clear skies by early afternoon, but as I was heading up the trail, heavy clouds were still hanging over the yttersia of Moskenesøy. Eventually in the evening, the sky finally cleared and I had a pretty good show of northern lights to watch. Dawn arrived clear and cold, with the first signs of that autumn crispness in the air. In my haste the previous day, I had forgotten my thermal long underwear, and as I was still desperately holding on to the last days with my summer sleeping bag, it was a chilly night! The warmth of that morning sunlight was quite welcomed. Soon however, the light lost it’s warmth and became somewhat dull and flat. So I packed up camp and headed down the mountain, getting back home for breakfast.